A Kriol dance performance at the opening ceremony of the Crooked Tree Museum and Cultural Heritage Center in Belize. 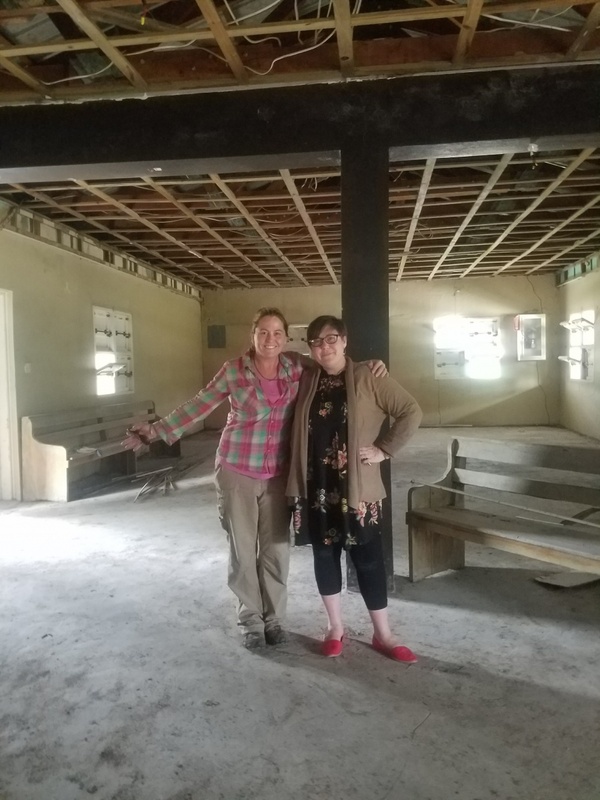 Professors Eleanor Harrison-Buck and Sara Clarke-Vivier stand in the building that has now become the Crooked Tree Museum and Cultural Heritage Center. Courtesy photo View more photos in this slideshow. 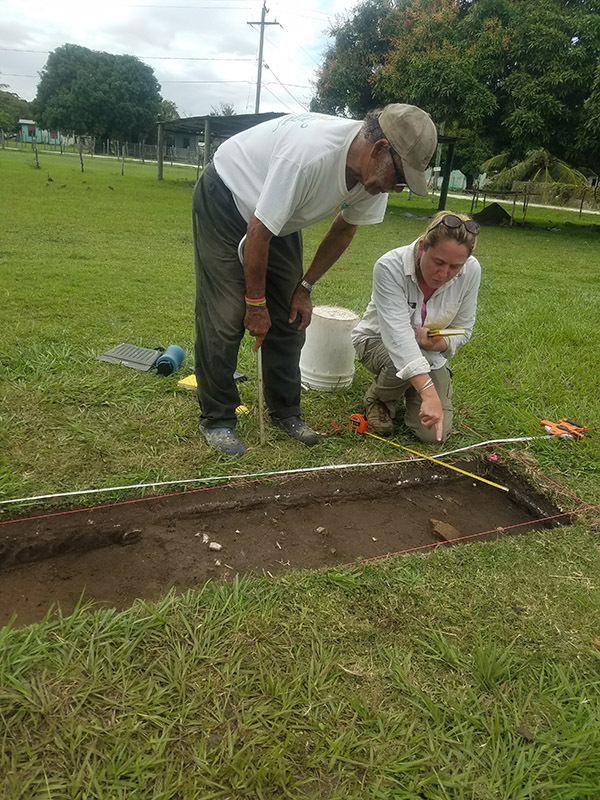 Eleanor Harrison-Buck, associate professor of anthropology at UNH, was awarded a $50,000 Whiting Public Engagement Fellowship last year to establish a public history museum in Belize that focuses on the Kriol (Creole) community. The museum, called the Crooked Tree Museum and Cultural Heritage Center, opened its doors on June 30. The museum was designed in collaboration with the village council and the local Kriol community, who descend from European populations and enslaved Africans brought to the former British colony in the 18th century for logging. The exhibition features the deep history of the lower Belize River Watershed, which Harrison-Buck has been investigating since 2011 as director of the Belize River East Archaeology (BREA) project. Sara Clarke-Vivier, a specialist in museum education and assistant professor of education at Washington College, collaborated with Harrison-Buck on the museum. In addition, members of the BREA research team contributed to the successful opening, as did members of the National Institute of Culture and History (NICH), whose Institute of Archaeology, Institute of Social and Cultural Research and Museum of Belize all offered support at different stages of the project. The exhibition housed in the Crooked Tree Museum and Cultural Heritage Center features over 10,000 years of occupation in this area, beginning with the archaeology of the Paleoindian and Archaic hunter-gatherers and continuing through the ancient Maya period. The major emphasis of the exhibition, however, is the last several hundred years of the late colonial period, featuring the Kriol history in the lower Belize River Watershed, considered the birthplace of Kriol culture. Working together with the local community, the BREA team developed an exhibition that combines their historical archaeological remains with archival records and also local oral histories to provide a fuller reconstruction of what life was like here and how different it was even just 40 to 50 years ago. Together with local teachers in Crooked Tree, the team developed content for the museum that complements the national social studies curriculum and will be useful for local teachers and of interest to Belize school children. “Our goal was to make the exhibits as engaging and interactive as possible, especially for kids. So, you can not only look at a dugout canoe but sit inside this dory carved from a single tree and imagine yourself paddling three days downriver to reach Belize City. That’s what people did before there were any roads to Crooked Tree,” says Harrison-Buck. The local community was involved in all aspects of the project — from donating the building where the exhibition is housed to the architectural design and renovation of the building to helping make pieces for the museum and offering to donate their own historic heirlooms. Community members were instrumental in serving as both informants and participants in the project. The Whiting Foundation yearlong fellowship allowed Harrison-Buck the time necessary to develop the museum. The building renovation and exhibition development were made possible by a grant Harrison-Buck received from the Alphawood Foundation of Chicago. Additional support was provided by UNH and Washington College. For more information on the Crooked Tree Museum and Cultural Heritage Center, visit its Facebook page.